Shine lives with her co-owner Jennifer DuRocher. 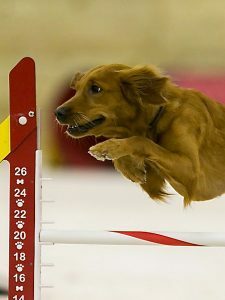 She is doing extremely well in the agility world finishing her MACH at age 3. She now has her MACH3 and is half way to finishing her MACH4. Shine is also in the agility dog hall of fame. The breeding of Shine to Yeti earlier this year produced 5 gorgeous puppies! After maternity leave Shine went back to work and despite a 6 month break being a mama she is currently in the top 20 GRCA Agility rankings.